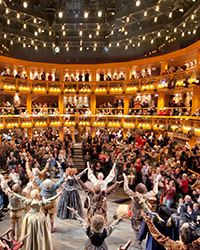 Unforgettable performances, larger-than-life characters, sumptuous productions—the 2013/14 Subscription Season promises to captivate, engage and inspire you. Our newly announced subscription season includes Shakespeare’s bawdiest comedy and most rousing history play, a classic romance and two show-stopping Sondheim musicals. The upcoming Subscription Season includes: William Shakespeare’s popular comedy The Merry Wives of Windsor, directed by Artistic Director Barbara Gaines; Shakespeare’s epic history play Henry V, staged by acclaimed British director Christopher Luscombe; and Edmond Rostand’s classic romance Cyrano de Bergerac, directed by Penny Metropulos and featuring Harry Groener (CST’s The Madness of George III, Jeff Award) in the title role. Continuing CST’s exploration of the Stephen Sondheim canon, Associate Artistic Director Gary Griffin stages two musicals spanning Sondheim’s prolific career, each propelled by uncompromising characters in pursuit of the American Dream. In productions scheduled to run simultaneously in two Chicago Shakespeare Theater spaces, Gypsy will be produced in the Courtyard Theater and Road Show will be re-imagined by Griffin in the theater Upstairs at Chicago Shakespeare. Three-, four- and five-play subscription packages are available, for as little as $40 per play. Subscribers also have the opportunity to enhance their season by adding thrilling theatrical events from our World’s Stage Series. CST joins the celebration of the Year of Italian Culture in America by presenting Piccolo Teatro di Milano’s Inner Voices this June. And, from Cornwall, England, comes the long-awaited Chicago debut of the internationally acclaimed company Kneehigh, which brings its brand of cheeky humor and Wagnerian intensity to retell one of the world’s oldest love stories, Tristan & Yseult. Join the Bard Circle, CST’S premier giving society, and your gift will be doubled by the Bard Circle Challenge Grant! Gain access to VIP ticketing, interval services, and behind-the-scenes events!